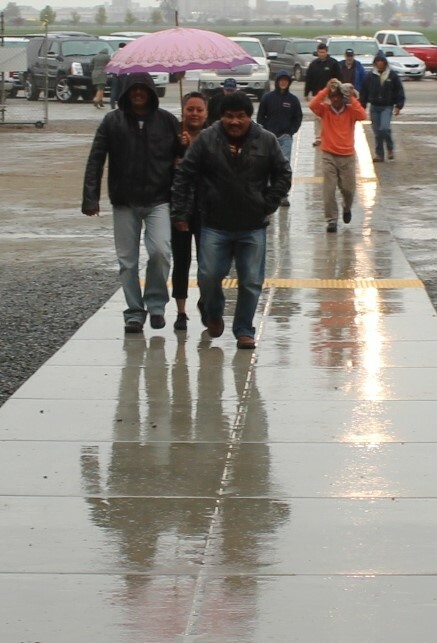 Walking in the rain to the Tulare water forum on March 26. Welcomed spring storms that ended March and began April brought generally modest amounts of rain to the valley along with greater Sierra Nevada precipitation that included enough high elevation snow to be better than average winter intensity. Northern California did even better. It even appears likely that, as a result, the San Joaquin River watershed’s 2013-14 natural runoff will likely brush, but may not break, the all-time annual record minimum. That mark, set in 1977, was less than 360,000 acre-feet. Last year’s San Joaquin unimpeded runoff, during a second consecutive dry year, was more than twice as much water – 856,626 acre-feet, about 48% of average. On a precipitation basis in the broader five-station San Joaquin River reporting index, the current year’s 16.3 inch average has already exceeded the index’s record 1924 minimum of 14.8 inches and the 1977 index of 15.4 inches. Unfortunately for parched Central California, a dry overall weather pattern that has dominated the climate for nearly 16 months preceded and followed the early spring storms, leaving drought conditions firmly entrenched and the Sierra Nevada’s overall water cup more than two-thirds empty. There was a modest early April upward bump in natural runoff forecasts for the San Joaquin River and other Sierra streams, and a slight easing of drought intensity reports in Northern California. All were merely short-term improvements. Southern Sierra runoff predictions during the peak April-July snowmelt period have resumed their decline. As of April 17, an updated California Department of Water Resources dry-scenario forecast for the San Joaquin River’s April-July period had fallen to just 21%. If normal precipitation were to occur through July 31, runoff could be up to 29%. Similar total runoff, based upon the crucial April 1 peak snowpack observations, is predicted for the water year concluding September 30 with the DWR’s driest scenario forecasting total runoff of 405,000 acre-feet. Warm mid-April temperatures have been melting snow and boosting the San Joaquin River’s calculated natural flow, the amount that would be occurring at Friant if there were no dams. By April 18, the natural flow was up to 3,385 cubic feet per second. Actual inflow to Millerton Lake was 2,473 c.f.s. Millerton Lake storage on April 18 was rising rapidly in the total absence of irrigation diversions. It stood at 181,463 acre-feet, 35% of capacity, only about 46,000 acre-feet higher than the reservoir’s “dead storage” pool of 135,000 acre-feet. Below that level, water could no longer be released into the Friant-Kern and Madera canals, which are designed to function by gravity. Hydrologists who monitor the Sierra snowpack and its water conditions say what little snow remains is clinging to the highest elevations, mainly along the Sierra crest. A small spring storm was predicted over the mountains at press time April 22. On Easter Sunday, of the 10 San Joaquin River watershed automated snow sensors reporting, only three had any water content. The greatest, 12.4 inches, was at 10,050-foot Volcanic Knob, east of Edison Lake in Fresno County. The April 1 survey of peak snowpack conditions found San Joaquin River watershed water contents averaging 34% of normal. The most, 57%, was on Volcanic Knob.